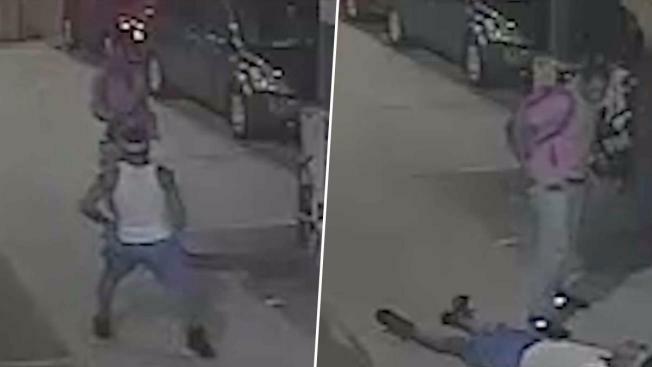 New video obtained by News 4 shows the off-duty NYPD sergeant who shot a man he claimed to be a robber Thursday morning appearing to shoot the man during a conversation before dropping an item by him. The footage, which contains no audio, shows the two men having words for about 20 seconds before the sergeant pulls his gun. The other man appears to brace himself before being shot. Afterward, the officer can be seen dropping a shiny item next to the man; he later returns and picks the item back up. Law enforcement sources told News 4 earlier on Friday that the two had an ongoing dispute, possibly over a woman. The off-duty NYPD sergeant who shot a man Thursday morning after he claimed he was a would-be robber had a prior dispute with him, law enforcement sources familiar with the case told NBC 4 New York Friday morning. Video of the confrontation, which has no audio, shows the two men have words for about 20 seconds before the sergeant pulls his gun. The sources added that it appeared the man tried to run away when the sergeant pulled the gun. Jonathan Dienst reports. 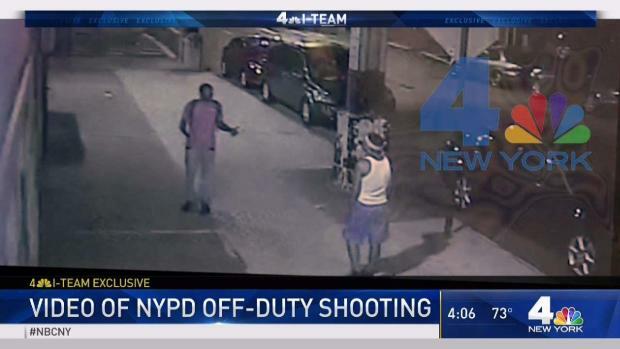 A spokesman for the NYPD said on Friday that the video is under review. "The video captures actions that raise serious questions, and require further investigation," said department spokesman Phil Walzak. "Recovered video is being shared with the Kings County DA." Law enforcement officials said during a Thursday press conference that there are still unanswered questions regarding the shooting in East New York on Livonia Avenue. The man is hospitalized in stable condition. The sergeant wasn't hurt, but was placed on modified duty, according to NYPD Chief Terrence Monahan. "There are certain things that we saw during this investigation that we have questions that are unanswered at this point. Until we answer them, we felt it was best to place him on modified duty," Monahan said. The NYPD sergeant was on his way to work Thursday morning when he shot the 21-year-old man. The sergeant later told police the man walked up to him in Brooklyn and said something like, "You're gonna die tonight," before pretending he had a gun and trying to rob him, authorities and sources familiar with the investigation tell News 4. The video, which has no audio, shows the two men have words for about 20 seconds before the sergeant pulls his gun. The 40-year-old sergeant, who works in Queens, told police he was was walking toward his car when the man approached him. The officer was wearing plainclothes at the time. The sergeant told police he said "don't rob me" and offered the man his cellphone instead. Then he pulled out the gun and fired twice, striking the man in the chin, authorities said. According to police, the officer said the man threatened him and acted as though he had a gun, though he never showed a weapon. In a Thursday afternoon press conference related to crime statistics, officials said a firearm was not recovered at the scene of the incident. The sources said a razor was found nearby but didn’t know if that was connected.